M T D N o v e m b e r 2 0 1 8 50 good on-road handing, comfort and a quiet ride of an all-terrain tire while having the rugged off-road capabilities of a pure mud- terrain tire. is makes them the best of both worlds for drivers. Chris Gomez, Toyo: Our Open Country R/T tires are meant to be a perfect solution for customers who want the aggressive looks and off-road performance of a mud-terrain tire but the on-road manners of an all-terrain tire. Toyo… and the Open Country R/T created this hybrid category years ago and today remains one of the strongest options for customers looking for the best of both worlds. Fardad Niknam, Yokohama: Customers who are looking for tires in between A/T and M/T, where an all-terrain tire is not aggressive enough but they don't want to compromise the noise that comes with M/T products. ey also generally don't want to pay the M/T price premium. MTD: Is the R/T segment growing? Mathis, Atturo: We are seeing consis- tently strong growth in our Trail Blade X/T. In certain sizes, it now outsells the same pattern in an M/T. ere are always new consumers and vehicle types being drawn into the segment. The range of vehicles now spreads from a Subaru Outback to a Cadillac Escalade. We believe the hybrid pattern is the future of the off-road segment. Dealers who do not have a hybrid type tire in their offering, are missing a growing segment of the market. Howlett, Falken: e R/T segment is definitely growing. Tire manufacturers continue to introduce these hybrid-type R/T products into the marketplace, and we see these new R/T tires on the road, but at the expense of all-terrain tires and mud-terrain tire sales, as the LT tire market is relatively flat. Gode, Hankook: is segment appears to be following the same trend as the vehicle market, where we see increasing sales of SUVs and light trucks. Wu, Maxxis: Our customers believe so, but whether it's cannibalizing A/T and M/T sales from the same brand is up for debate. Naval, Nitto: It's difficult to provide empirical evidence that this new segment is growing within USTMA as it does not have a separate designation for these products. However, our sales number shows that our offering, the Ridge Grappler, is growing at an exponential rate and is becoming the flagship tire within our light truck segment offering. We also see other manufacturers introducing new products in the segment. Dyhrman, Nokian: As consumers con- tinue to spend an increase of their funds on vehicles, and the truck market continues to grow, it makes sense for the R/T segment to continue to flourish as well. Vehicles are a large investment, and more and more consumers are realizing the care necessary to maintain the longevity of them. Cati, Omni United: Yes, this segment is growing in the U.S., and there are more rugged-terrain tires on the market with more expected to come. One of the reasons why this is getting popular is that drivers like to have an aggressive-looking tire and still like to enjoy the on-road benefits of their new vehicle. Gomez, Toyo: e Open Country R/T has seen steady growth ever since its introduc- tion to the marketplace. We believe that as customers' knowledge of tire performance grows, the Open Country R/T is well posi- tioned to achieve even further growth in the years to come. Niknam, Yokohama: ere is no recog- nized segment as R/T. However, customers are getting more interested in these kinds of in-between products because they will answer their aggressive taste with less compromise on noise. MTD: Do you market an R/T tire line? 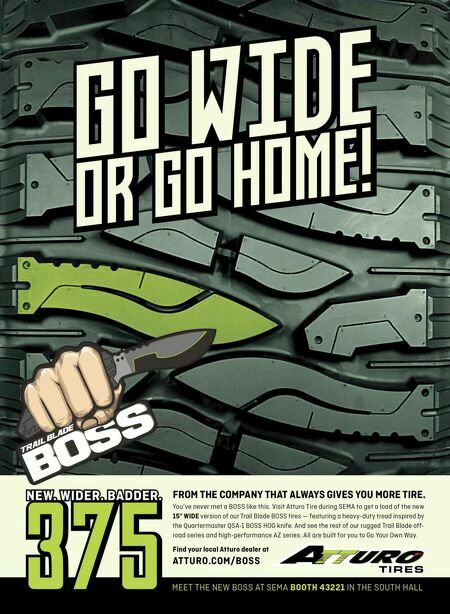 Mathis, Atturo: Atturo continues to build out the Trail Blade X/T range with more sizes being added on a regular basis. Jamieson, Cooper: At the time of this writing, Cooper does not have an R/T product on the market, but as you can see by our responses, this is a category that we are quite engaged with and one where we are working to understand the consumer. Howlett, Falken: Currently, Falken does not market an R/T line, but we took the approach with our WildPeak A/T3W all-terrain product offering to be nearly as rugged and capable as many of the R/T tires on the market. We are always evaluating new product concepts and will continue to evaluate the feasibility of an R/T tire in the WildPeak product line, but currently we see an R/T tire being a tight squeeze between our WildPeak A/T3W and our WildPeak M/T. Gode, Hankook: We anticipate adding this to our lineup in the near future. Han, Kumho: We do not currently offer in the market a product that was developed as an R/T segment product. Our Road Venture MT51 would fit best in this category, though, as it is what we consider a mild M/T... with a quieter ride and enhanced handling. Wu, Maxxis: We don't have an R/T line, but we are always evaluating potential segments. 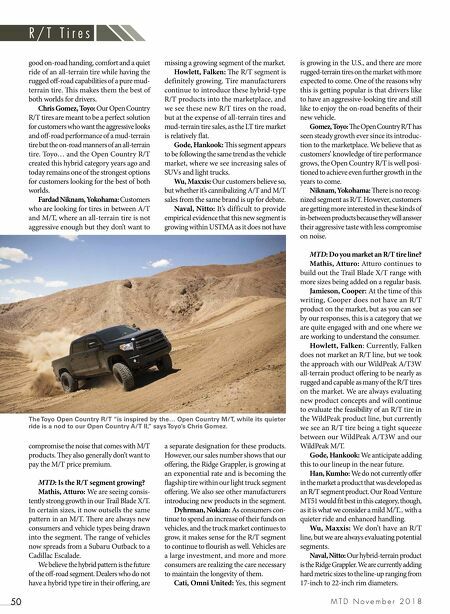 Naval, Nitto: Our hybrid-terrain product is the Ridge Grappler. We are currently adding hard metric sizes to the line-up ranging from 17-inch to 22-inch rim diameters. R / T T i r e s The Toyo Open Country R/T "is inspired by the… Open Country M/T, while its quieter ride is a nod to our Open Country A/T II," says Toyo's Chris Gomez.